NEW YORK, New York — Armenia Fund USA donated much needed laptops to several institutions of culture and education in Armenia and Karabakh following its $ 20.8 million Thanksgiving Day Telethon fundraising efforts. Museums devoted to literature, fine arts and history were selected. Included are: three house museums in Gyumri (Shirak province) - the Hovhanes Shiraz House Museum; the Avetik Isahakian House Museum and the Mher Mkrtchian House Museum. Other museums included, the Perj Proshyan House Museum in Ashtarak, Aragastotsn Province, the Aksel Bakunts House Museum in Goris, Syunik Province and the Stepan Shahumian House Museum and Cultural Center in Stepanavan, Lori Province. These museums celebrate an important person who has enriched Armenian cultural life, such as Avetik Isahakian, a writer and poet and Aksel Bakunts, a brilliant writer whose collection of short stories Mtnadzor (The Dark Valley) has recently been translated into English by Nairi Hakhverdi and published by Taderon Press. These museums inspire tourists and native Armenians alike to appreciate the rich contributions these artists have made to the Armenian literary tradition. With these donations, Armenia Fund USA continues its ongoing support of cultural and educational programs and the vital role that technology plays in advancing the research and preservation undertaken at these institutions. The donated laptops are equipped with 5-in-1 digital media and high definition BrightView displays, and loaded with Genuine Windows 7. Their use will add ease to personnel’s day-to-day operations as well as support their ongoing research and presentations. The recipient art museums counted an impressive array as well. Among those benefiting are the Vanadzor Museum of Fine Art in Lori province; the E. Charents Museum of Art and Literature in Yerevan; the Martuni Art Gallery (Martuni, Gegharkunik Province); the Jermuk Art Gallery in( Vayots Dzor Province; Hrazdan Art Gallery (Hrazdan, Kotayk Province); and in the city of Etchmiadzin, the Etchmiadzin Art Gallery. Museums dedicated to historical and cultural studies included the Hovhanes Tumanyan Museum in Dsegh (Lori); the Museum of History in Djrarat (Hrazdan); the Armenian National Association for Preservation of Historical, Cultural and Heritage Museums and Landmarks in Yerevan; the Orbeli Brothers Museum in Tzaghkadzor (Kotayk Province); the Nicoghayos Adontz National Historical Museum in Sisian (Syunik Province); and the Arthur Mkrtchian Museum of National History in Hadrut (Karabakh). The Orbeli Brothers Museum, a 45-minute drive from Yerevan, is an especially interesting draw, as it celebrates the lives of three incredibly accomplished brothers who contributed immensely to the sciences in their respective careers. The eldest brother, Ruben, spoke 12 languages and was at the forefront of underwater archeology in his day while the middle brother, Levon, founded the Physiology Institute of Armenia in Yerevan in 1946. Youngest brother, Hovsep, after a successful career as director of the world famous Hermitage Museum of St. Petersburg, founded the Armenian Academy of Sciences and became its first president (1943). Other recipients benefiting are: the Kanaker-Zeytoun hospital in Yerevan and the St. Gregory of Narek Youth Center in Vanadzor, which recently opened in the fall of 2010. 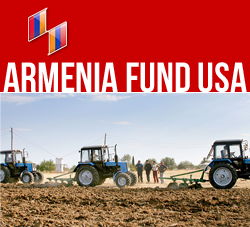 As always, Armenia Fund USA is grateful for the continuous and generous support of United Armenian Fund, an indispensable player in bringing valuable specialty equipment and technology directly to the designated recipients.